It was an odd day, weather wise. Largely dry with just one quick, light shower, windy at times, sunny spells… Luckily nothing interfered with the fieldwork! The res team consisted of myself (when I wasn’t putting in grids for people), Ellen, Tim and Pauline. They pulled out the stops and managed a record-breaking eight grid squares. Area-wise, that is what the GPR covers in an average day, but for resistance survey at 0.5m intervals, that is very good going. Well done everyone. The resistance survey at the end of day 32. 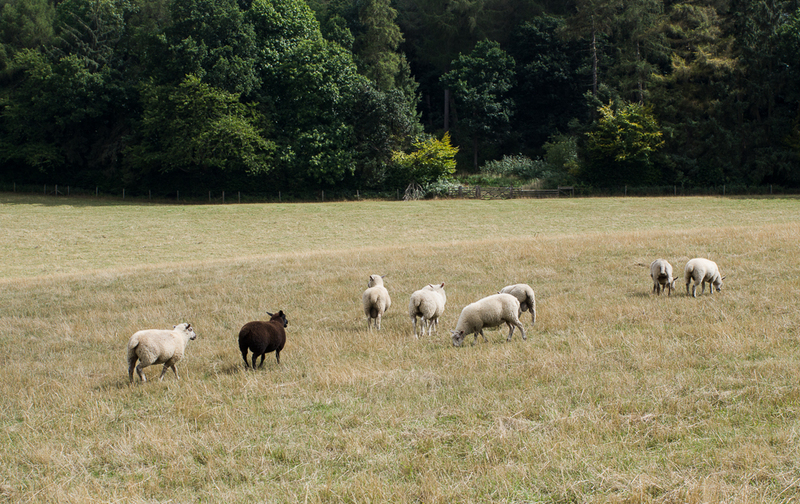 Today’s grids behaved themselves and make the four odd ones from yesterday stand-out even more. I did make sure that some of the connectors were off the ground today. How annoying. We may have to re-do those four grids. 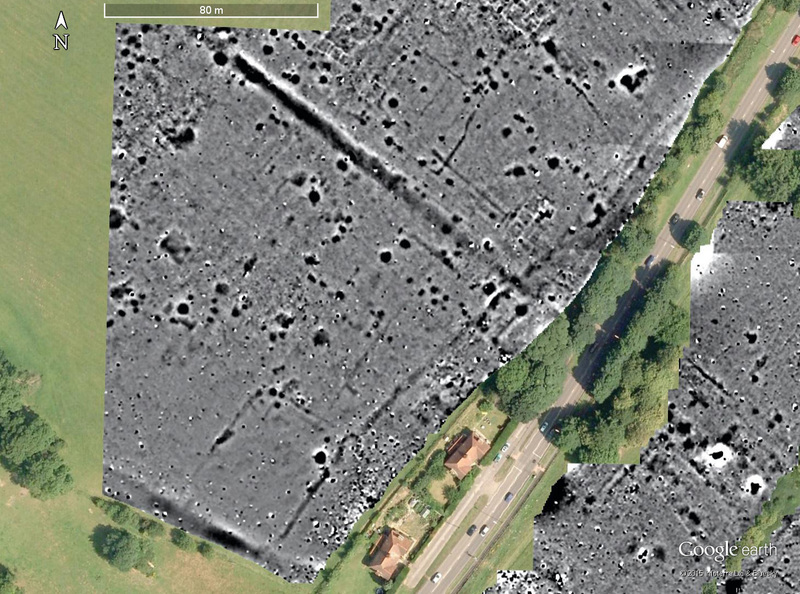 The survey did, however, show the buildings along the road in the SE corner beautifully. The big question… where now? North to the sinuous ditch? South for more shops? West to cover the cross roads? 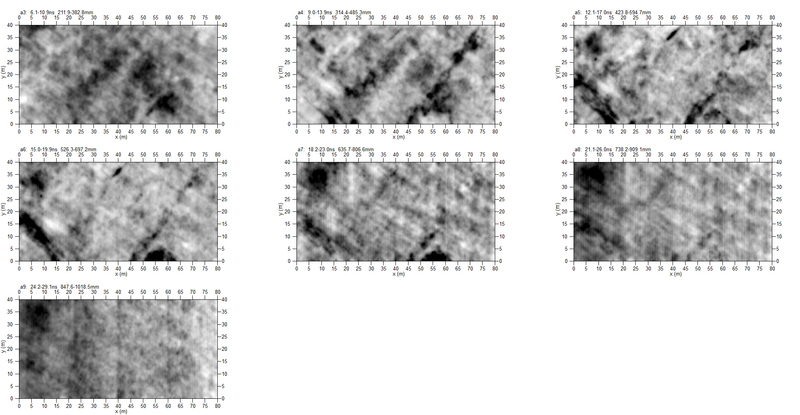 Only four days surveying left, and we have to assume that we won’t cover eight squares every day. The mag team also had a very successful day in the Macellum field. 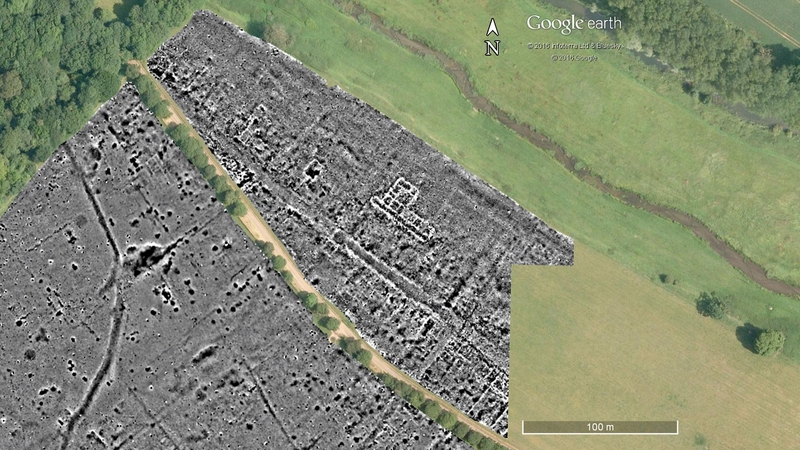 Detail of the mag survey showing the Macellum field. We can just see a hint of the cross-roads running NE-SW across Watling Street. The ‘1955 ditch’ barely shows. With the eye of faith one might see it in the high readings along the edge of the cross-road, but very much with the eye of faith. Is the ditch just so built over we cannot see it? Or was it never built here? With just four survey days left to go, the team is getting close to finishing the field, but I think we are a day or two short of being able to do that. The entire mag survey to date. 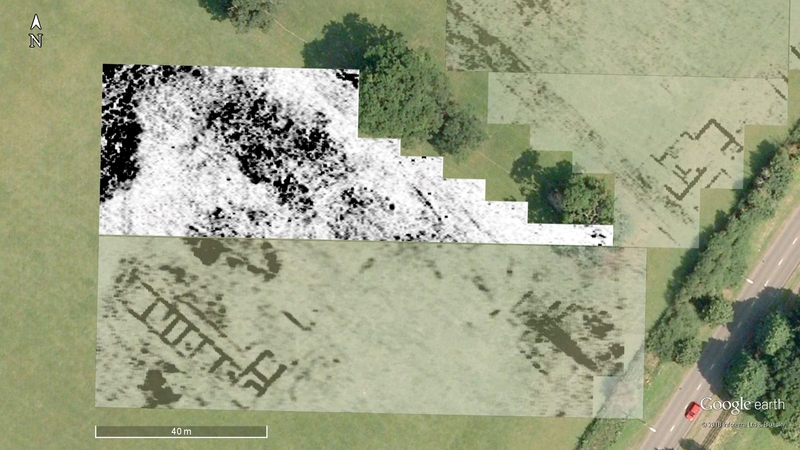 Way down across the field, the GPR team tackled another fiddly staggered bit along the hedge line. In the next three images I have made the previous days’ surveys partially transparent. The day 32 GPR, slice 3 (12.5 to 15.5ns). The day 32 GPR, slice 4 (15.5 to 18.5ns). The day 32 GPR, slice 5 (18.5 to 21.5ns). The curious shallow valley to the west of the surveyed area (‘valley’ seems a strong word for it!) that runs down the hill towards the temple is just as devoid of buildings or other recognizable archaeological features as the mag data. In all three time slices not a great deal shows. Was this valley always empty? Or has the archaeology been eroded away, or even buried? 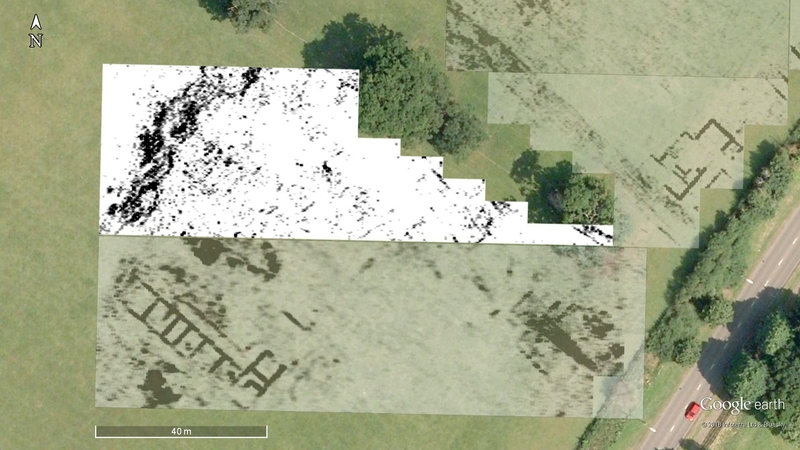 Difficult to say, There is, however, a long narrow building just to the right of the middle of the surveyed area almost parallel with the hedgerow. It seems fairly ephemeral, but it definitely there and one corner was picked-up in last year’s grid to the south. Although the GPR hasn’t covered as much as the mag, we have still collected a mass of data. 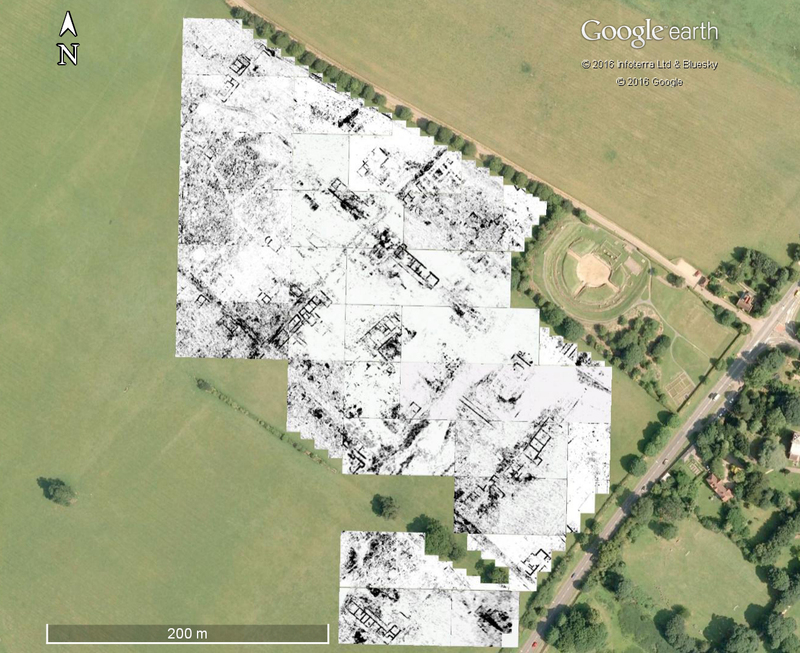 Montage showing the area surveyed with the GPR to date. It certainly takes-up a large chunk of my hard disk. Many thanks to everyone who came out today and worked so hard. A very successful day all round. Our next survey day is on Thursday. This entry was posted in Verulamium and tagged 1955 ditch, ahrc, Arts and Humanties Research Council, CAGG, earth resistance survey, geophysical survey, Gorhambury, GPR, GPR survey, Ground Penetrating Radar, Hertfordshire, magnetometer, magnetometry, magnetometry survey, Roman, Roman town, St Albans, ucl, Verulamium, Watling Street on August 21, 2016 by hertsgeosurvey. Just a quick posting with some images this evening as I have been out celebrating the publication of a book I edited. We started off with some partials in the bottom corner and then began the long transect back to the north. The survey after day 11. It will be another couple of days before we hit the hedge line by the drive. 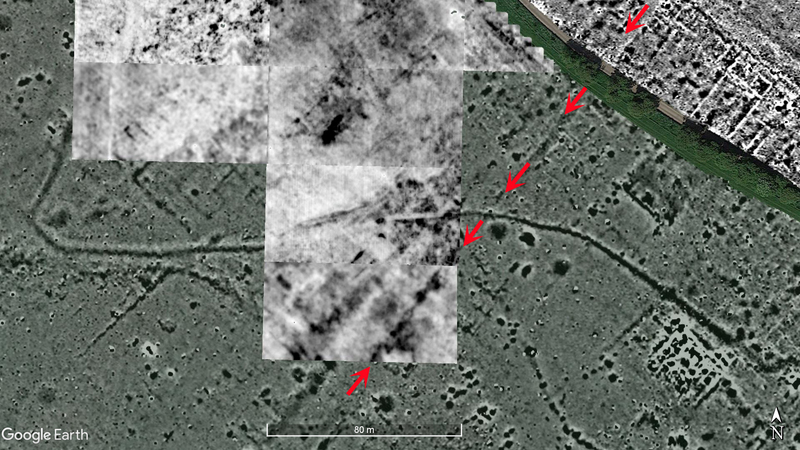 Looking at the new area in more detail we can see we have picked up more of the 1955 ditch. The area surveyed on day 11. 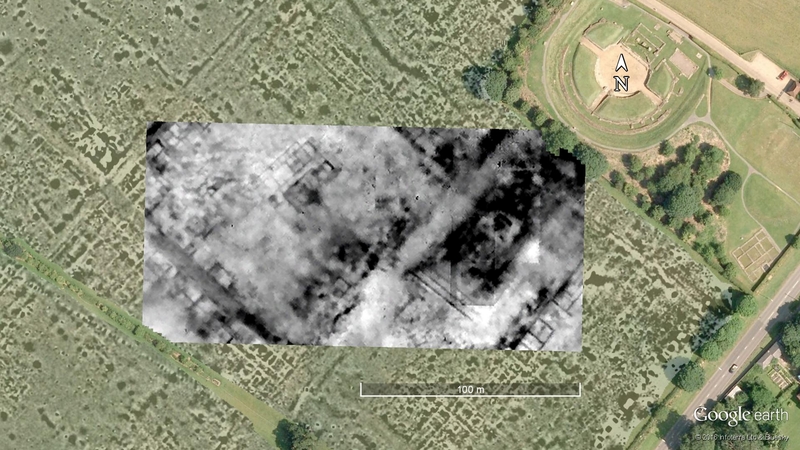 There is an interesting rectangular enclosure in the far south, lots of pits and other cut features, but nothing which looks like the stone buildings further south. Neil Linford in his report on the 2000 survey suggests this might have been more of an industrial area. There is also what looks like one side of a break in the 1955 ditch. Tomorrow’s results will be important to see if this is so. The program processing the GPR data is still running! I’ll post the results tomorrow. 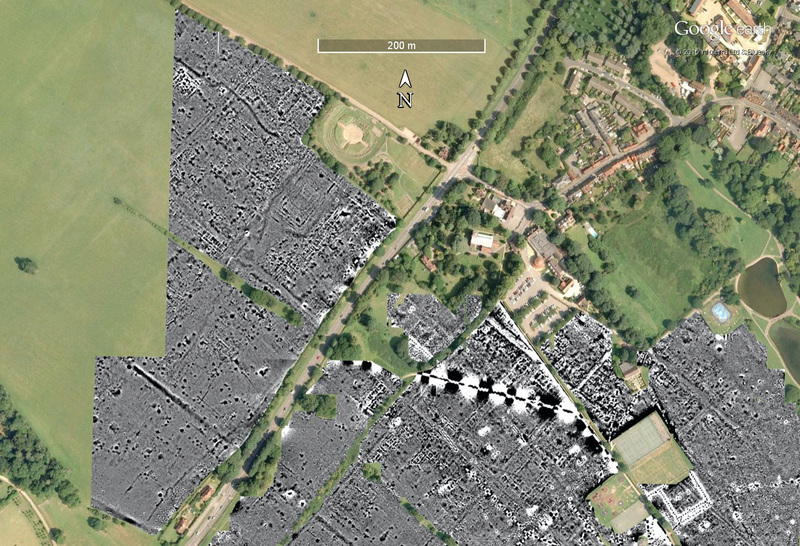 This entry was posted in Verulamium and tagged 1955 ditch, ahrc, CAGG, magnetometry, magnetometry survey, Roman, Roman town, ucl, Verulamium on August 21, 2015 by hertsgeosurvey. Today saw a smaller crew than some days, but we still managed to collect mag data and a little GPR data. Many thanks to everyone who joined in. Mike Langton from Mala came to see how we were getting on with the GPR. The mag crew are working south into the bottom corner of the theatre field. The mag survey after day 9. As we might expect from the pattern we saw in the park, this area is quieter than the area nearer to the theatre and the temple, although there are some rather large positive anomalies, very large pits, perhaps? We encountered an old friend: the ‘1955 ditch’. 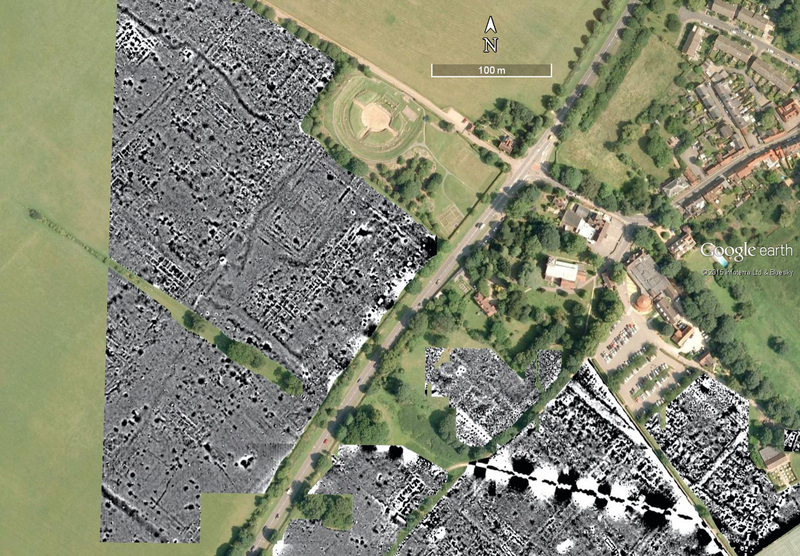 The first few squares we surveyed in Verulamium Park in June 2013 encountered this feature. The ditch is the late first century boundary of the town constructed in about AD 80. It is called the ‘1955 ditch’ because Sheppard Frere found it under a building in 1955. It surrounds the town on three sides. 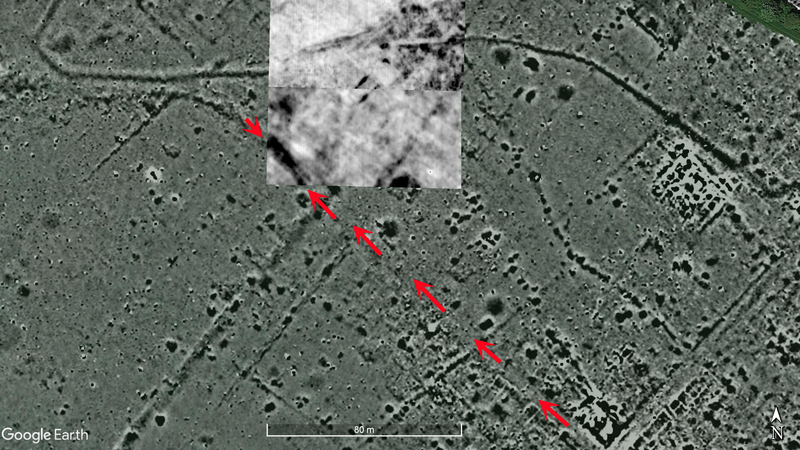 The survey area showing the line of the ‘1955 ditch’. 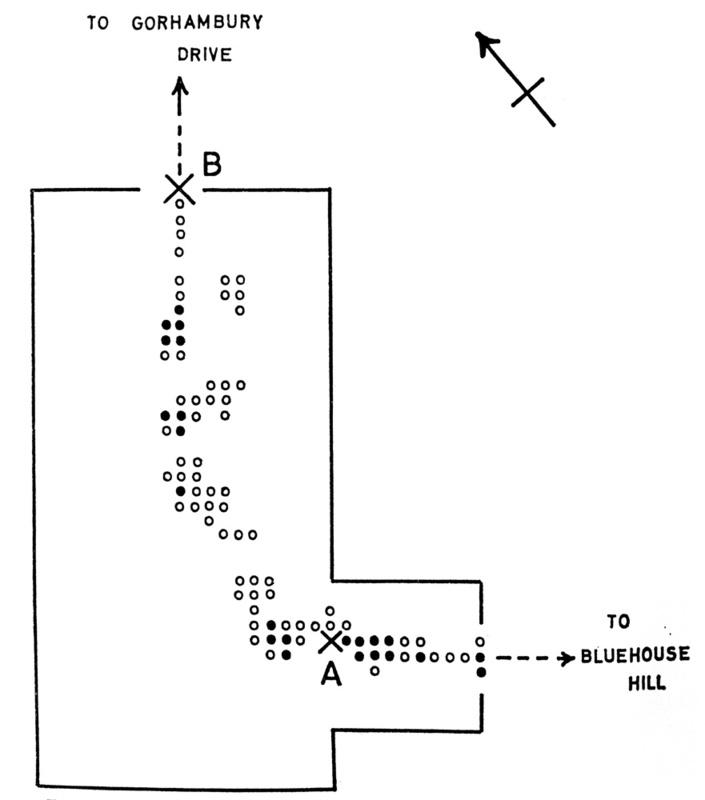 In 1959 and 1960 Martin Aitkin used magnetometry to trace the line of the ditch. He was assisted by Rosalind Niblett (see the picture in Alban’s Buried Towns’, p. 52, see also Internet Archaeology, 6, 2002). At the time, the technique seemed incredibly fast, although now it would seem painfully slow. The results were published in the journal Antiquity in 1960 and 1961. 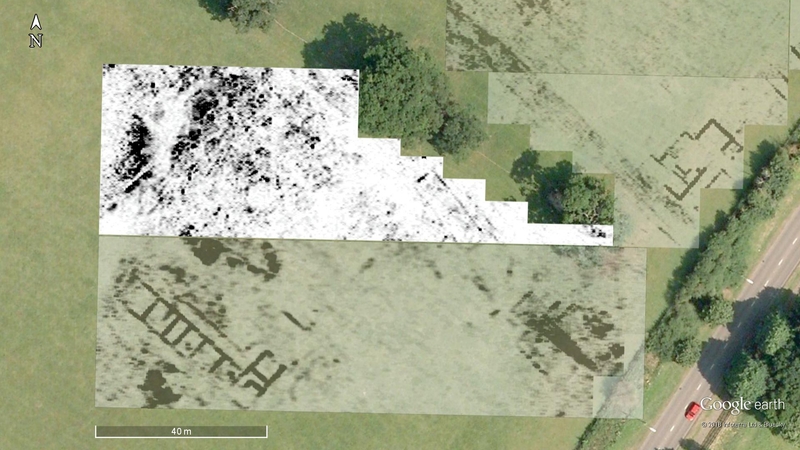 The mapping of the NW corner, which we have yet to reach, looks pretty basic compared to today’s images. 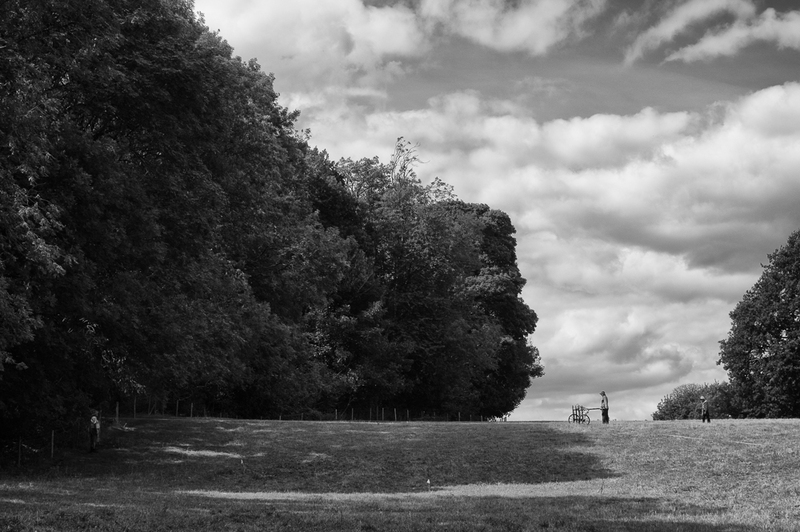 Martin Aitkin’s survey of the NW corner of the 1955 ditch. Black dots are highly magnetic, open circles moderately magnetic, and blank is the background. It did, however, work and thus began the development of a technique which is a mainstay of archaeological prospection in the 21st century. Martin did, however, have problems with the southern corner of the ditch as he did not want to hammer pegs into that most hallowed of ground to an Englishman: a cricket wicket. He went on to survey areas in Verulam Hills Field south of the town (Antony 1968), and at the King Harry Lane site to the west (Stead and Rigby 1989). Aitkin, M. J. 1960. 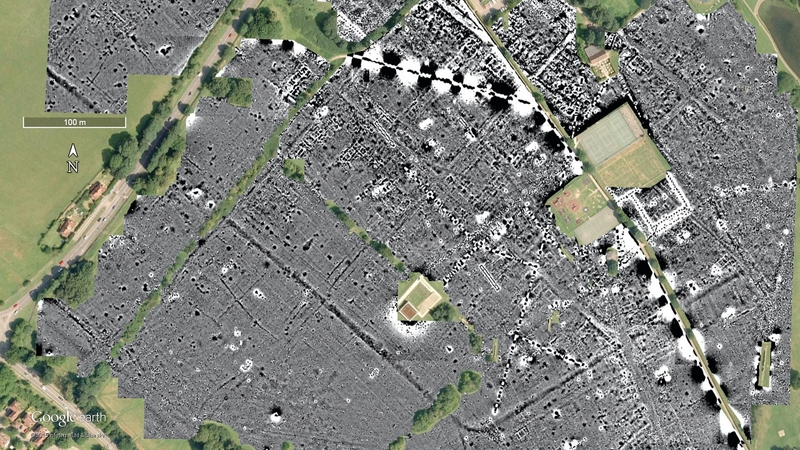 `Verulamium 1959: the magnetic survey.’ Antiquity 40: 21–24. Aitkin, M. J. 1961. `The magnetic survey.’ Antiquity 41: 83–85. 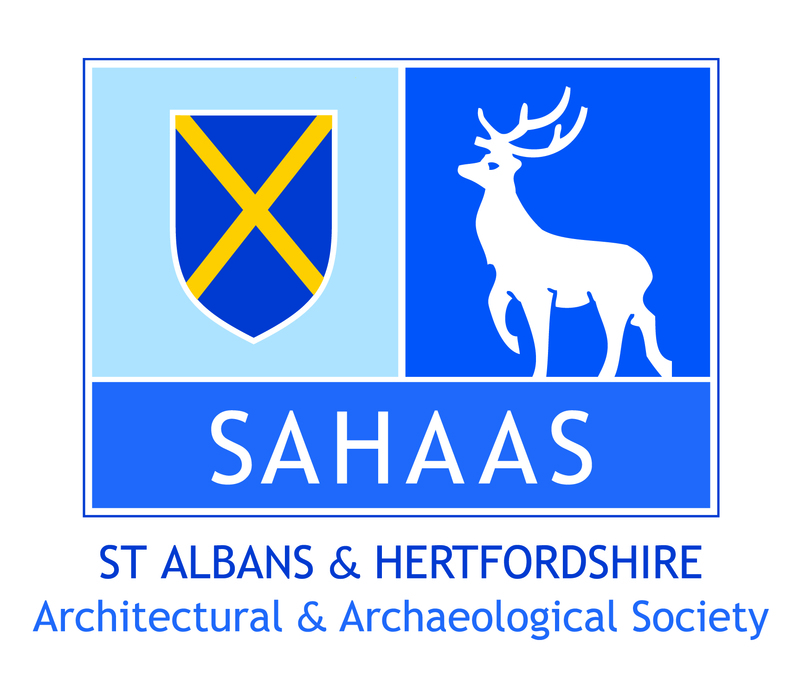 1963–4.’ Hertfordshire Archaeology 1: 9–50. Niblett, R. & I. Thompson 2005. Alban’s Buried Towns. 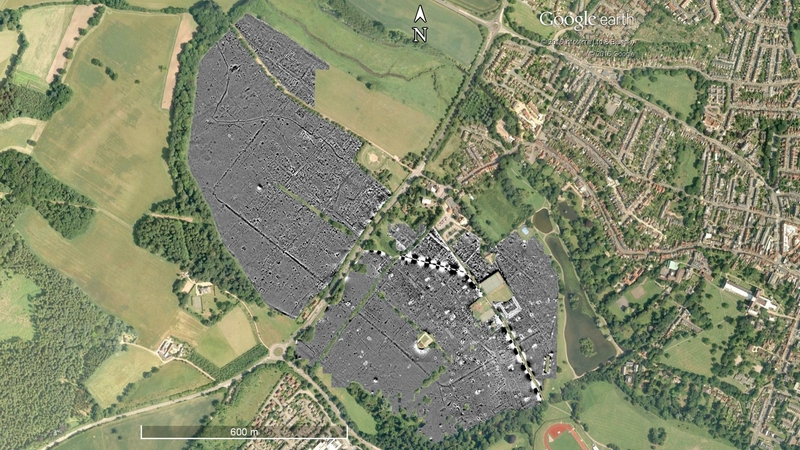 An assessment of St Albans’ archaeology up to AD 1600. Oxbow Books, Oxford. Stead, I. M. & V. Rigby (eds.) 1989. Verulamium: the King Harry Lane Site. 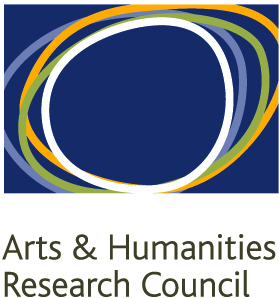 English Heritage Archaeological Report No. 12. English Heritage in association with British Museum Publications, London. 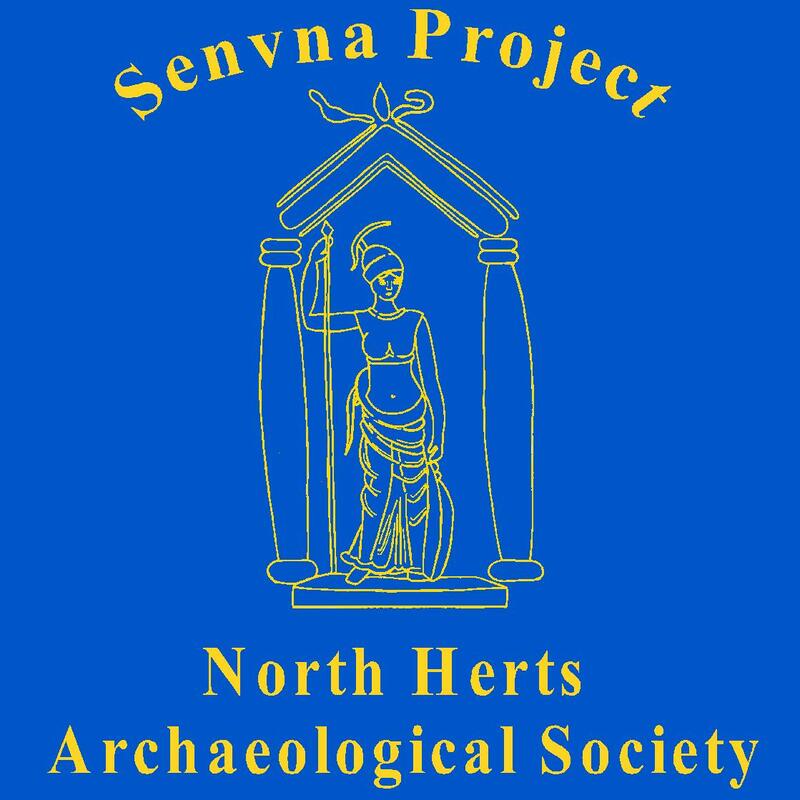 This entry was posted in Verulamium and tagged 1955 ditch, GPR, Ground Penetrating Radar, magnetometry, Martin Aitkin, Roman, Roman town, Shepperd Frere, Verulamium on August 19, 2015 by hertsgeosurvey.